Flight Lieutenant Bryan Colston, “A” Flight Commander – 225 Squadron in Spitfire Mk. 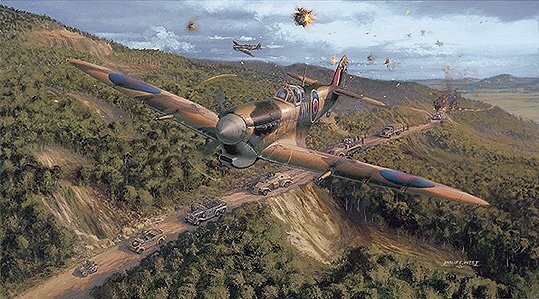 VB, ER 660 attacks a German Transport Convoy on a mountain road near Sjedenane in Tunisia with Pilot Officer Melvyn Evans flying as his wingman – 6th March 1943. Primary Edition signed by Flight Lieutenant Bryan Colston, “A” Flight Commander – 225 Squadron (the pilot in the main Spitfire) and Wing Commander Hank Costain MBE, Spitfire pilot 154 Squadron.